4 What can the veterinarian do? Both species of chinchilla lives in the Andean Mountains and are used to the climate conditions there. They have developed various adaptations to handle cold and windy conditions well, but struggle when exposed to warm weather and high humidity. When we keep chinchillas as pets outside their normal geographical range, this is something that we need to be aware of and take into consideration. A chinchilla can begin suffering from heat exhaustion even when its human owner doesn’t experience any issues, and chinchillas are known to be prone to heatstroke. The human body is covered in sweat glands that help cool us down, but the chinchilla is covered in a very thick fur instead. Heat exhaustion is less serious than heatstroke, but is still a condition that should be treated immediately in chinchillas. Heat exhaustion is sometimes a precursor to heatstroke, but sometimes heatstroke develops very quickly in chinchillas without the owner noticing any sings of heat exhaustion first. SADLY, THERE ARE MANY EXAMPLES OF CHINCHILLAS DYING FROM HEATSTROKE. Overheating poses a serious risk to the life of a chinchilla. Prevention is essential, and so is learning how to act if you think that your chinchilla might be suffering from heat exhaustion or heatstroke. The recommended temperature for chinchillas is 21 °C (70 °F) and below. They can typically handle somewhat higher temperatures, at least for a short amount of time, and especially if it is still shady, the air is dry, they have plenty of water to drink and they don’t exert themselves physically. However, temperatures exceeding 27 °C (80 °F) can be dangerous even for short moments. This means that in some parts of the world, air-conditioning will be required if you want to keep chinchillas. It is also necessary to have a back-up plan about how to act if there is a power outage or the air conditioner brakes. Do you have a car with air-conditioning? Do you have somewhere else that you can go with your chinchilla if there is a power outage in your area? Remember, chinchillas are not warm-weather animals. It is true that their geographical range are in the tropics and subtropics if you look at a map, but the wild chinchillas live far up in the mountains at high elevations where tropical heat in unheard of. Just because they are from South America doesn’t mean they can cope well with heat. Never place your chinchilla’s cage in direct sunlight. 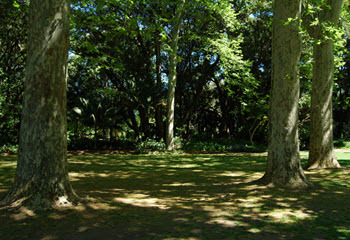 If the temperature are high, even semi-shade can be a problem. Sunlight can quickly warm up a spot to dangerous levels even if the rest of the room feels cool. It is important that the environment is well-ventilated. N.B.! Remember that a fan only helps with ventilation – it doesn’t actually lower the temperature in the room unless it is sucking in cooler air from somewhere else. 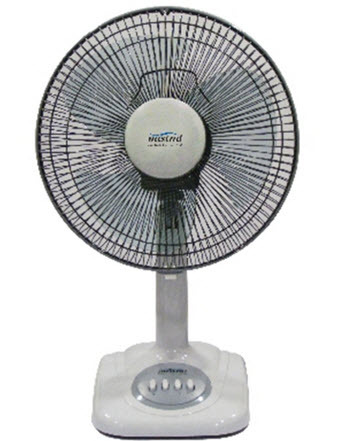 Fans are great for animals that can sweat, or are soaked in water (e.g. a dog that you just hosed down), but they are much less useful for someone who is covered in dry, dense fur. Make sure that your chinchilla always have access to plenty of water. If the water is in a bowl or tray, frequently check it to make sure it is still clean and haven’t been splashed out. Staying hydrated doesn’t make it impossible to develop heat exhaustion or heatstroke, but it lowers the risk and also prevents a wide range of health problems associated with dehydration. 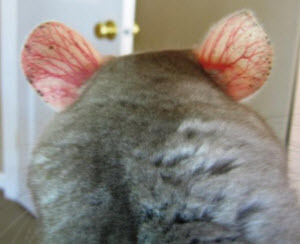 Parts of the chinchilla’s ear has very little fur. If a chinchilla gets too warm, it will try to cool off by diverting more blood to these parts. This will make the ears look more pinkish than normally or even red. You might even be able to see the veins. This color change is a warning sign that should be taken seriously. Rapid breathing can be caused by various factors, and one of them is overheating. When rapid breathing is combined with red ears, is is usually a sign of overheating. Just like rapid breathing, drooling can be caused by various factors and you need to take the whole situation into account. Drooling combined with red ears and/or panting is often a sign of overheating. Overheating will make your chinchilla very tired and listless. Being physically active will only generate more heat, making the problem worse, so your chinchilla is trying to be as still as possible. Sometimes, overheating chinchillas will not even want to sit up, they just lie down. Overheating can make the chinchilla unconscious. This is of course a very serious symptom. If you suspect that your chinchilla is overheated, you need to act right away. Every moment counts. It is usually best to act first, even before calling the veterinarian. 1.) Move the chinchilla to a cooler environment. If you are inside, go to the coolest room in the house, such as the basement or a room with air-conditioning. If you are outdoors, try to get indoors, and if this isn’t possible, seek out the shade. The best temperature in this scenario is 50° to 70° F (10° to 21° C). Sometimes, the only way to expose your chinchilla to this temperature quick enough is to open a refrigerator and stand in front of it, holding up the chinchilla to the cold. (Do not snuggle it to your chest, since this reduces exposure to cold air.) Of course, chinchillas should NOT be placed in a closed refrigerator. You can place it (on a suitable surface) inside the refrigerator, but leave the door open and do not leave the chinchilla alone. ABOUT WATER: It is generally not advisable to bathe chinchillas, but if your chinchilla is near death from heatstroke and you can’t use any other method to cool it down, you must break the no-bathing rule and soak your pet. Make sure the chinchilla doesn’t get its head under water. Do not use super-cold water or put ice cubes in the water, since this can be too much of a chock to the warm animal. After you have moved your chinchilla away from the warm environment, soak a piece of cloth in water and use it to dampen your chinchilla’s outer ears. You will need to re-soak the cloth once in a while as it gets warmed up. Remember, the chinchilla will try to cool itself by diverting hot blood to its ear, so cooling the ears will help cool the whole body. Also, water leads away heat quicker than air, so even a wet cloth that is room temperature will be better than air. You can also use a wet cloth to help cool off the paws of the chinchilla. ABOUT ICE: Avoid using ice directly on any body part, since this can cause injuries. If the situation is extreme and you need to use ice, put a piece of cloth between the ice and the chinchilla’s body. Move the ice around; don’t keep in on a specific spot for very long. If your chinchilla is conscious, make a weak saline solution. Taste it – it should be less salty than tears and ocean water. Gently give the chinchilla a few drops of the saline solution. Do not try to pour water into the mouth of an unconscious chinchilla. As a chinchilla owner, it is a good idea to own a thermometer that you can use to check your chinchilla’s body temperature. The body temperature of a healthy chinchilla is around 100 degrees Fahrenheit (37.8 degrees Celsius). Even if your emergency care has managed to get the temperature of the chinchilla down and removed the symptoms of overheating, it is still a good idea to contact your veterinarian right away and follow their instructions. The vet might want you to bring the chinchilla in for an immediate check-up. Among other things, the vet might decide that the chinchilla needs fluid therapy to aid in the recovery. The vet will probably also want to check the blood pressure and heart rate, and take a blood sample to find out if the kidneys are working properly. There can also be some neurological issues to watch out for. In some cases, the chinchilla will need to stay with the vet for observation for a few hours or overnight.